On Sunday afternoon each year the workshop gathers to honor departed friends and colleagues. Following a presentation in the barn of the work and lives of Eddie Adams' six close friends killed in Vietnam we make our way up the hill to a small clearing in the trees where a stone sits engraved with their first names. A Native American ceremony precedes the laying of six sunflowers and the releasing of yellow balloons into the sky. When a friend of the workshop passes, a red or purple balloon is sent up that year to honor them. 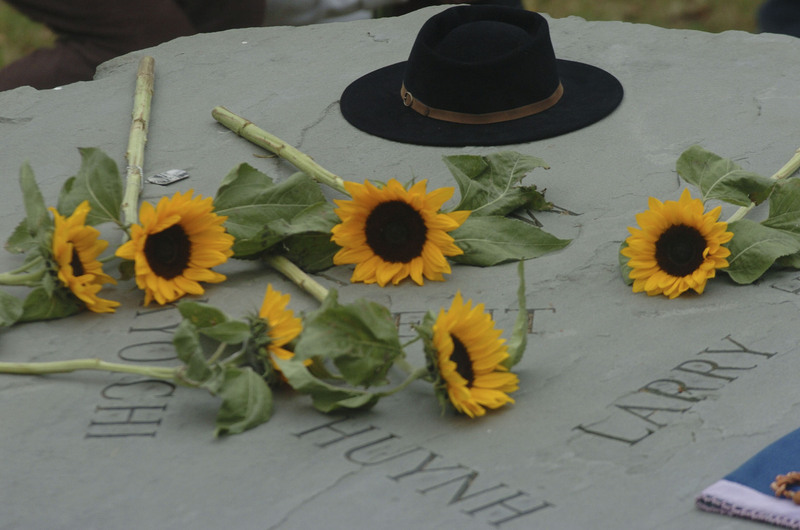 Since 2004, when Adams died, his trademark hat is placed on the stone as well and a black balloon released in his memory. Since 2011, a seventh sunflower is also set down to honor our colleague, friend and former student and faculty member, Chris Hondros, whose tragic death links two generations of the Eddie Adams Workshop family in a heartbreaking way. Larry Burrows was born in London in 1926 and joined LIFE magazine there in 1942 when the city was war-torn. While he covered wars in the Middle East and the Congo for LIFE he had numerous other assignments throughout the world that were unconnected with conflict. From 1962 until his death in 1971, Burrows covered the Vietnamese War. He twice received the Robert Capa award from the Overseas Press Club and in 1966 was named magazine photographer of the year by the School of Photojournalism at the University of Missouri. 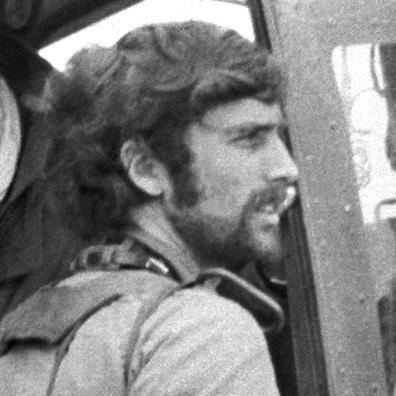 In February of 1971 Burrows was killed along with Henri Huet and Kent Potter when their helicopter was shot down over Laos. Henri Huet was born in the mountain resort of Da Lat, northeast of Saigon. He spent his childhood in Normandy, returning to Indochina as a cameraman for the French Navy. Following that he worked for several years as a photographer for the U.S. Information Service and joined the Associated Press in 1965. In 1967 Huet was wounded at Con Thien but returned to the front lines after only a few months of medical care. In 1969 he was awarded the Robert Capa award from the Overseas Press Club for “superlative still photography requiring exceptional courage and enterprise.” Huet was killed along with Larry Burrows and Kent Potter in 1971 when their helicopter was shot down over Laos. 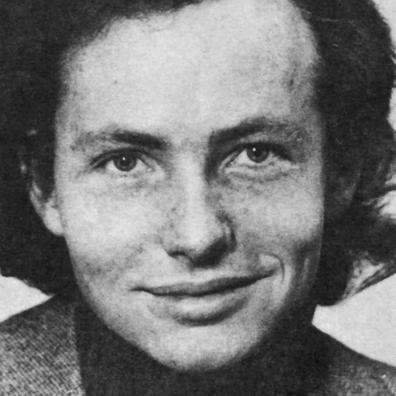 Michel Laurent began working for the Associated Press in 1968. He won the Pulitzer Prize for his work in the 1971 India-Pakistan war. His photographs of Bangladesh won numerous awards, including the World Press Photo contest and a citation from the George Polk Memorial Award. He documented stories in Africa, the Middle East and Asia. Laurent joined Gamma in 1973. In April 1975, he was killed during action between South and North Vietnamese troops. 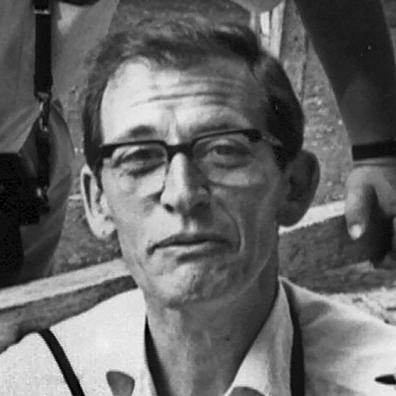 Laurent was the last journalist killed covering the 30-year Indochina war. Kent Potter was born in Philadelphia in 1947. At the age of 16 he joined the United Press International. He went to Saigon for the first time in 1968 and later became UPI’s news photography manager for Vietnam. 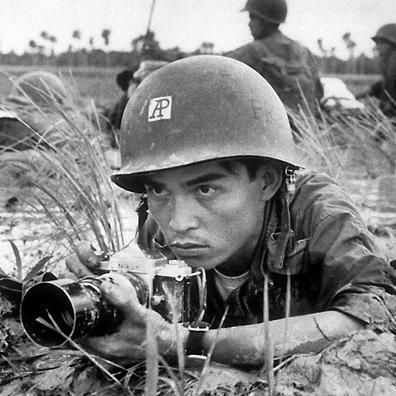 He later transferred to Bangkok but continued to photograph the war. Potter was killed along with Larry Burrows and Henri Huet in 1971 when their helicopter was shot down over Laos. Kyoichi Sawada was born in northern Japan in 1936. After graduating high school, he worked in the photo shop of a U.S. base. 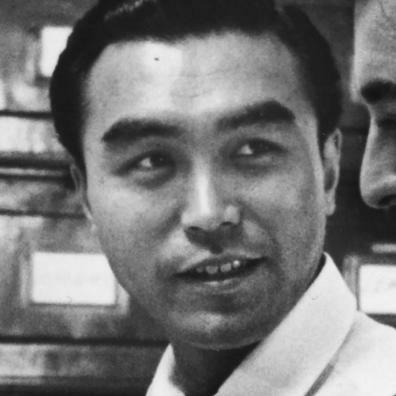 He later moved to Tokyo where he worked for UPI, who named him Photographer of the Year in 1965. He won the Pulitzer Prize in 1966. He moved to Hong Kong in 1968. 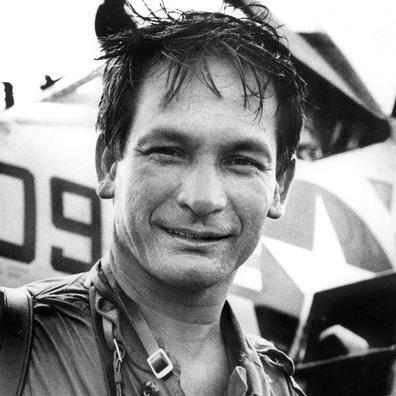 He was killed in Cambodia in 1970 in an ambush along with another UPI reporter.